The pilot was more commonly known as the cow catcher. Early on American railroads there was a problem with live stock wandering onto the tracks causing the engine to derail as they were run over. As the years went by the cow catcher was reduced in size as more range land was fenced and as the locomotives grew bigger and were less likely to derail if an animal was struck. 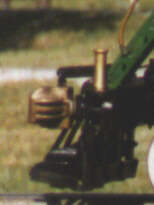 A coupler was also here for use on pusher service or in switching cars in a yard or siding. The large brass posts are flag stands. British engines did not have cow catchers as most of the land was already fenced by the time trains began to run.